Check out this sound structured, dark pigmented, practically built bull that is moderate framed and deep bodied. Not only does he have the right build but is backed by an impressive pedigree and charts above average for the economically relevant traits of growth and milk. 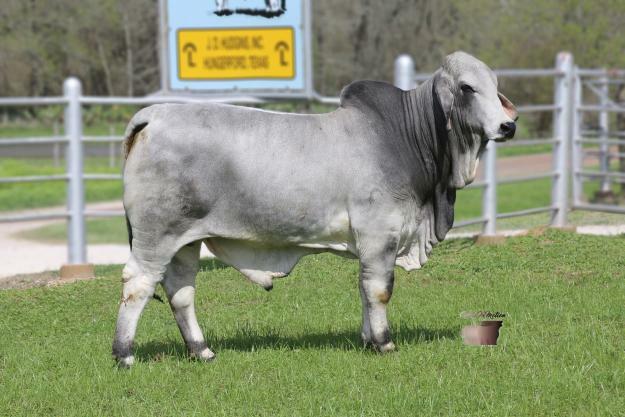 275/1 is sired by +JDH Mr. Manso 638 the many time champion, producer of sale toppers and most recently was recognized as producing the #2 Grey Show Cow of the Year for 2017. The bottom side of 275/1’s pedigree is equally as impressive being out of a young up and coming daughter of JDH Mr. Manso 887/4 one of our top producing sires of both show animals and replacements and the 2007 Reserve National Champion Female, JDH Lady Manso 864/4. Take advantage of the opportunity to purchase a young sire that offers it all!